Definition: The process of changing one form of energy into another. For example, the chemical energy in gasoline can be converted into kinetic energy (energy of motion) by an automobile engine. Definition obtained from the K - 12 Energy Education Program (KEEP). The principles of energy conservation described by the thermodynamic laws are demonstrated in the various energy conversion processes that follow. This physics/engineering project begins with the sun; its radiant energy is converted to electrical energy by photovoltaic (solar) cells. Electric energy is then converted to useful mechanical energy by motors. And mechanical energy is converted to electrical energy by electric generators. The Energy Story is a good website that describes what energy is. How energy and work are related. An excellent website that explains the relationship between electric power and energy is here. Where P is Power; t is Time; W is Work; Power is work per unit time; and E is energy; Power is energy converted per unit time. The sun's electromagnetic radiant energy is in fact optical energy and the instruments that measure optical energy are also used to measure solar energy. Volt meters measure the electro-motive force (tension or pressure) that causes an electrical charge to flow (current) and current meters measure the flow rate of electric charge (current). A Gauss meter measures magnetic field strength. Electromagnetic induction is used to convert electrical energy to mechanical energy and it is also used to convert mechanical energy to electrical energy. Good website describes how magnetism is used by motors to convert electrical energy to mechanical energy. Another excellent website describes how magnetism is used in motors and generators to convert electrical energy to mechanical energy and how mechanical energy is converted to electrical energy. Tachometers measure the rotational speed of a motor's shaft and torque meter measures a motor's torque. The above instruments are used to demonstrate the conservation of energy principles when energy is converted from one form to another. Let's take a look at how all this is done. 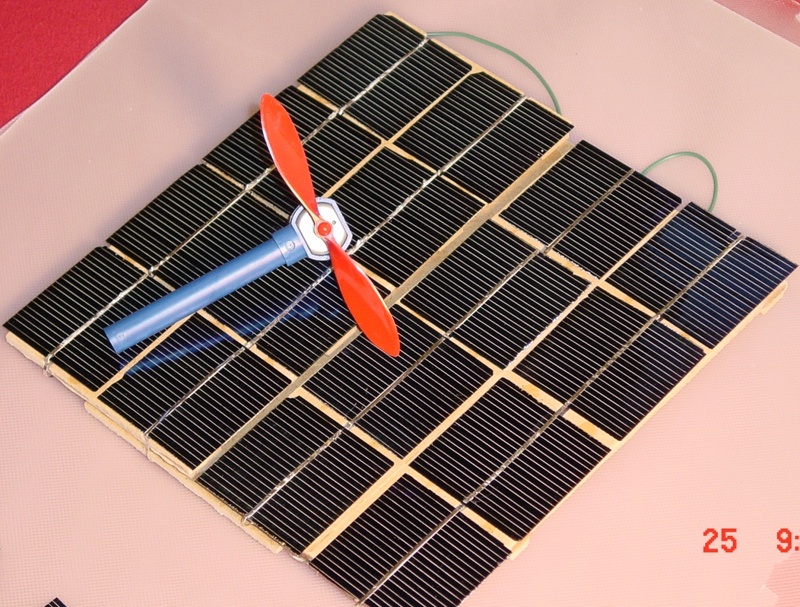 Photovoltaic Cells convert electromagnetic radiant power to electrical power. California Solar Engineering has a short course that explains how solar panels work and how they are constructed. A fantastic website for young and old on how Photovoltaic cells convert solar energy to electricity is Green - Planet - Solar - Energy.com. Enough can't be said about this website for learning the basics of solar energy. To understand how solar photons are converted to flowing electrons, the chemical theory of materials, specifically Silicon, must first be understood. The Green - Planet - Solar - Energy.com website has a fantastic column of links on the left side. Scroll down to Some Theory and underneath it click on Solar Chemistry 1. There you will find the clearest explanation of the atomic electron structure of materials and how photons free electrons in Silicon material. Wikipedia has a good definition of Photovoltaic Cells. International Light has The Light Measurement Handbook that explains how light energy is measured. The Solar Energy Science Project will present to you only the essentials to understand and to measure optical power. Motors use magnets and electromagnetism to convert electric power to mechanical power. The basics of how DC motors use electromagnetic fields to cause a motor's shaft to rotate are illustrated here . Wikipedia explains how motor and generators use magnetic fields and current carrying conductors to convert energy. A short write up from the Electric Motor Handbook explains how a motor converts electrical power to mechanical power. The Electric Motor Handbook states that in most machines dissipation from losses is small enough to approximate mechanical power with electrical power. This fact will be investigated in this website. We provide a means of measuring mechanical power using a torque/rpm measurement apparatus. Generators use magnets and electromagnetism to convert mechanical power to electrical power. Brian Kross has a brief overview how generators convert energy from what originally started out as solar energy. Please scroll down to Direct Current Generators of this website for detail how a generator uses electromagnetism to convert mechanical energy to electrical energy. Conservation of energy. The Joule and the Watt are some of the energy and power units used in optical, electrical and mechanical engineering work. How electrical energy is measured. The Joule and the watt hour are a measure of energy. 1 watt-hour = 3600 Joules of energy. These units must be clearly understood. A Brief discussion of Energy Conversion Units is an informative website. A general description of Energy Conversion and Thermodynamics is presented by the K-12 Energy Education Program website. To get started with the detail of how to measure power go to the Power Measurement page. Copyright © 2010 Applied Technologies. All Rights Reserved.